My niece and nephew were visiting over Easter weekend and the following week. I was lucky enough to have them visit at my house for a night to spend time with my son and me. I like to do fun culinary preparations with them as they love to cook as well. I asked them to come up with any dish they would like to make. My niece came up with Fettuccine Alfredo with Shrimp. Yummmmm. I already had buffalo steaks out so that covered the boys. My mom let me know this wish and I had all ingredients, except the fettuccine. I thought I would substitute penne, since I already had that in the pantry. But then I got to thinking, why not make the pasta. I have the ingredients and the equipment. So we made the fettuccine from scratch. Enter the fun! It is easier than one may think and it is extremely fun. 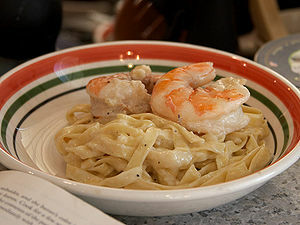 Here is a link on how to make fresh pasta dough http://allrecipes.com/HowTo/Making-Pasta-Dough/Detail.aspx. I used a recipe with all-purpose flour since that is what I had on hand, but there are so many recipes out there, find one you like and go for it. I have a Kitchen Aid stand mixer with the pasta attachments. This makes short work of homemade pasta. But it was fun. My niece and I went through about 1/2 of the dough and I asked her to get her brother and my son to see if they wanted to join the fun.. They just told her to leave thinking she was lying about how much fun it was.. so I went down and asked, “Hey – can you come up and take some pictures of your sister making pasta?” Of course they HAD to come up then. One they saw us using machines and laughing, they jumped right in and wanted to make some, too. Within a couple of minutes and lots of laughs later, all the dough was transformed into Fettuccine. By all means, use store-bought pasta, especially on a work/school night. There is nothing wrong with that and it is faster and tastes good, too. Homemade pasta will become a weekend treat in my house. The taste is so much better and adds fun with kids. If you don’t have the equipment, you can do it by hand, it just takes longer. Looks easy, right? It is. In a pot large enough to hold all the pasta, fill 3/4 with water and about 1 TBS salt to a boil over high heat. Toss the shrimp with 1 TBS garlic, 2 TBS olive oil, pinch of salt and pepper. Let sit for about 15 minutes. Over medium heat in a large sauce pan, add 1 TBS olive oil and 1 TBS butter. Once the foam subsides, add in the shrimp. Once one side starts to turn pink, flip and finish up the other side. Pay close attention, as shrimp cooks really fast – about 1 minute per side. Pull the shrimp off just before they are done. Don’t worry – they will continue to cook and will be added back to the sauce to finish up. Put them in a bowl to the side until ready to add back in. In same sauce pan, add remaining butter and garlic over medium heat (too high, you will burn the garlic and butter). Let the butter melt and saute the garlic until it begins to get soft. Whisk in cream. Continue to whisk until butter and cream is mixed together, add the Dijon, fresh ground pepper and fresh herbs (if using) and continue to whisk until the mixture starts to simmer. Let simmer for about 3 more minutes (continue to stir/whisk so it does not burn). Add in the cheese and continue to stir/whisk until all the cheese is combined with the cream and melted. Taste. Adjust flavor by adding salt, pepper, Dijon, more cheese and/or more butter. If it is too thick, don’t worry. You can use some of the pasta water to thin it out. Add the shrimp back in. Reduce heat to the low setting. Once the pasta is done, DON’T strain it, instead, using tongs, lift the pasta from the pot (ok to have some water still on it) and stir in the sauce. If too thick, go ahead and stir in about 1/4 cup of the pasta water. You can turn the heat to med-low to finish cooking everything. You can also add vegetables to make it a well-rounded one-dish dinner: Sugar Snap Peas, Peas, Broccoli, spinach, etc.. all will go well with this dish. Posted by culinaryease on April 30, 2011 in Cooking for two or less, General Cooking, Recipes and tagged Fettuccine Alfredo, Parmigiano-Reggiano, Pasta, shrimp. I love making this and my family loves this too. I also use the Kitchen Aid to make life good!! !